Underage drinking comes at a cost. Your hopes. Your dreams. Your future. 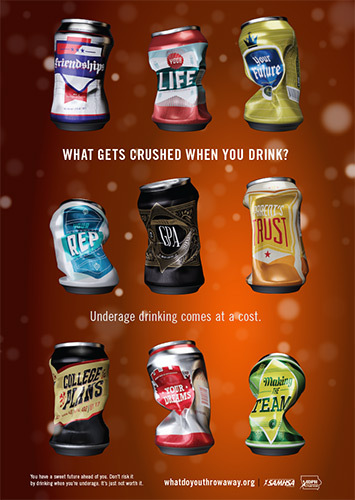 A lot of things get crushed if you drink when you’re underage. And that’s not all. Drinking can cause brain damage. Ruin friendships. Make you lose your parents’ trust. And put you at a greater risk of developing alcoholism. It’s pretty clear, isn’t it? Underage drinking just isn’t worth it. How much do you know about the dangers of underage drinking? Find out by answering the questions below. Then tap or click to reveal the answer. True or False Alcohol poisoning cannot be slept off, and if untreated can result in seizures, permanent brain damage, coma and death. 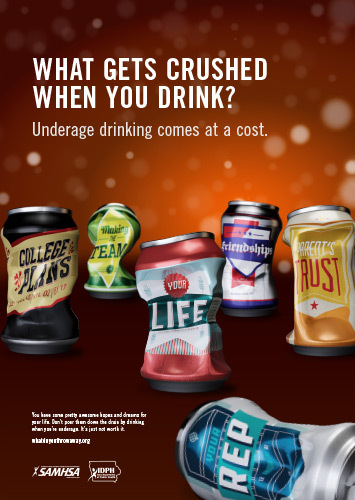 True or False Annually, about 5,000 teens die from alcohol-related injuries. Have a story about how underage drinking has affected you or someone you know? Join the discussion and submit your own story or a quote that inspires you not to drink. Is there a quote that inspires you not to drink? Have you created a quote of your own that you would like to share? Post it. If you think you could have a problem with alcohol, we’re here for you. Find your local treatment facility or prevention agency below and then give them a call. It’s confidential. It’s free. And it’s the one of the best ways to talk to someone who cares and can get you the help you need. Underage alcohol use is a serious problem. Surveys show alcohol is the most frequently used drug in Iowa. The Iowa Department of Public Health Bureau of Substance Abuse’s goal is to combat underage drinking and reduce alcohol related problems. This project is funded by Iowa Department of Public Health, through the Substance Abuse and Mental Health Services Administration (SAMHSA) of the U.S. Department of Health and Human Services. BROUGHT TO YOU BY THE IOWA DEPARTMENT OF PUBLIC HEALTH. Copyright © 2019 What Do You Throw Away When You Drink. All Rights Reserved.